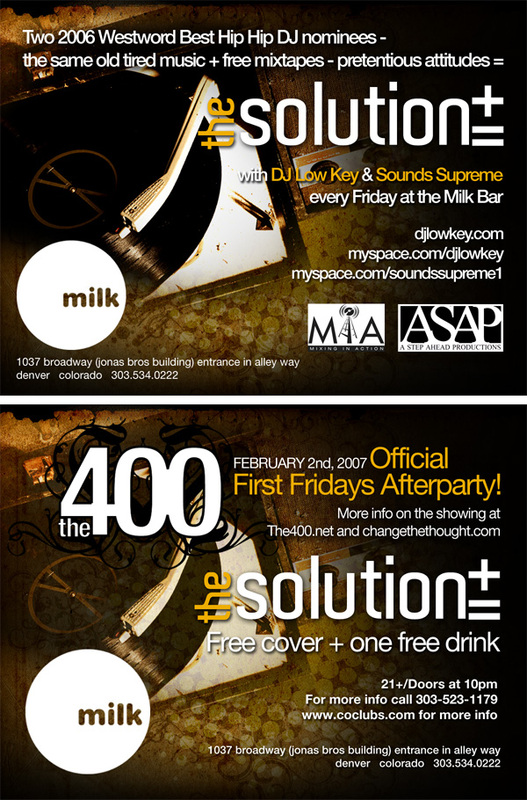 2 2006 Westword Best Hip Hop DJ nominees – the same old tired music + free mixtapes – pretentious attitudes = The Solution with DJ Low Key & Sounds Supreme at the Milk Bar. Come check out a unique weekly night with fresh music, fresh concepts and more. But first stop by First Fridays at The 400 from 7-10 for an exhibition by Change The Thought aka Chris Cox with framed art prints, new clothing and complimentary food and drinks. While you’re there, pick up a special invite for the official afterparty at The Solution that’s good for no cover and a free drink. The Milk Bar is located at 1037 Broadway in the lower level of the Shelter. Its design is inspired by the bar in the movie “A Clockwork Orange”, and features an unbelievable Yorkville sound system that is second to none amongst venues of its size in Colorado. But don’t take my word for it, come check things out on a Friday and see for yourself.